I won't show yet today, but the plan is to go over to the coleseum and get Diva in the arena. She's never showed in something like this so I wanted to give her the chance to see it before the first class. They allow you to access the ring and ride between the morning and afternoon sessions. 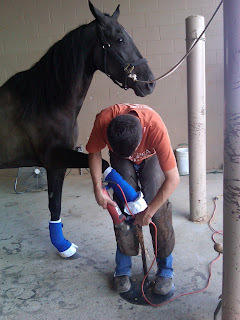 Besides I've been nervous about Diva's shoes being compliant and there is a farrier onsite who can check and correct anything that this little Ameteur isn't aware of is a rule. With one call from Jane we find out that Divas shoes need to be ground down a fraction of a fraction or she could be turned down. So a 1pm appt is set over coffee on Janes deck that morning. I'm still worried about Bourbon. And from so many of your messages and texts, you all are too. So I went over to see if I could get a report. When I arrived, his stall door was ajar and he was not in his stall. My heart dropped. I could see BJ and Bradley in the back. And Stacey was there too. I mustered up the courage to go find out what was up. As I went through the hallway into the cross tie area, I could see Bradley was tacking up B! He was going to ride him. Stacey said the vet said he was fine and they were going to work him. So that was good news. I watched while he was ridden and he looked loose and I thought he was shaking nicely. So at least this was not a serious setback. Not sure I'll be showing him, but at least he's just fine. Whew! We can all breath now again. Diva's shoes are 100% compliant! Jane and I then went up to the cowboy shop to get my western hat fixed. (that is the actual name of the store!) It had rippled from being stored in the heat and so had to smoothed out. The girl did what she could by hand, but I may have to find a place that has the blocks to get it perfect one of these days. Diva entered the ring and got right to work. Man she just loved the footing in there. It was like riding in Oshkosh, the place in Wisconsin that she goes best. She is shaking hard, and I can hear that wonderful 4 beat rhythm and my heart bursts with joy. I am on cloud nine. If she gives me rides like this and I don't get a ribbon, I have won more than I could hope for this week. I am going in to win...and will be 'on the clock,' Scott I promise, every ride. And may the cards land where they may. 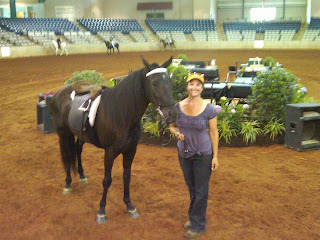 Diva and I after our warmup at MTSU in Miller Coliseum. Back at the trailer while cooling down, we hear a commotion and man yelling, horses screaming and then hooves running down the drive. A grey horse is on the loose and headed our way. Both Jane and I run out to try to stop the horse. It takes about 6 of us to corral him, and the end result is a huge open gape in this horses leg. I run for a vet, and get to meet Dr Jana Anderson as a result. Well gotta tell ya, I think that can make your heart pump more than show nerves. (Terre I'll give you the full story in the car...you'll get a laugh out of it.). That evening I go to the first night of the show. 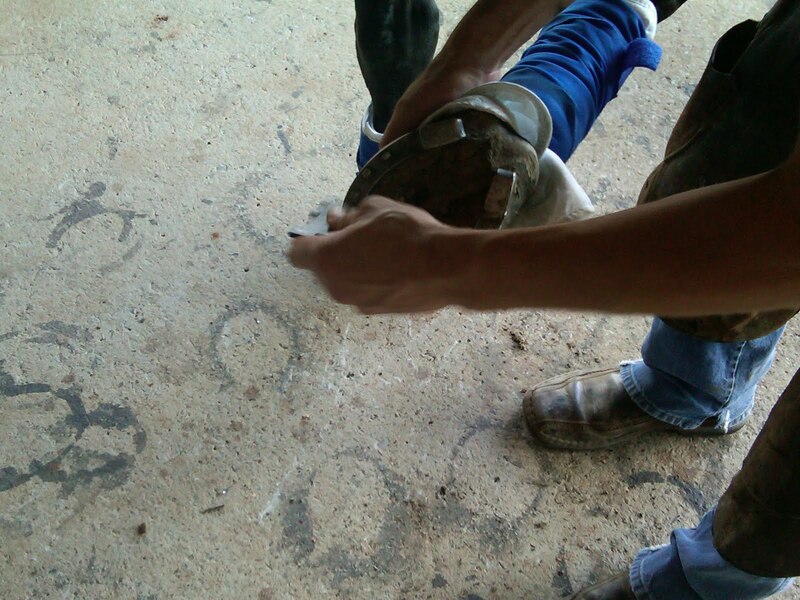 I watch a little, and I help the Colt Center clan with the horses and riders. The group is in the ribbons all night. A good testament to all Bobby's talent and hard work. The evening ends with a progressive barn party. Basically a pot luck. It was a cool opportunity for me to meet some of the folks I only see or read about in my walking horse weekly magazines. I brought a Wisconsin cheese platter to share. My favorite dish was the jumbalya that Darden and John Gladney brought from Louisiana. It's midnight, I'm exhausted, and I head home. Today has been a great day. And I'm now excited and ready to start showing tomorrow!